Chamber of Lies is a location in Lords of the Fallen. This area is accessed after finalizing Yetka's Quest, and will give you access to the last Lord in the game. 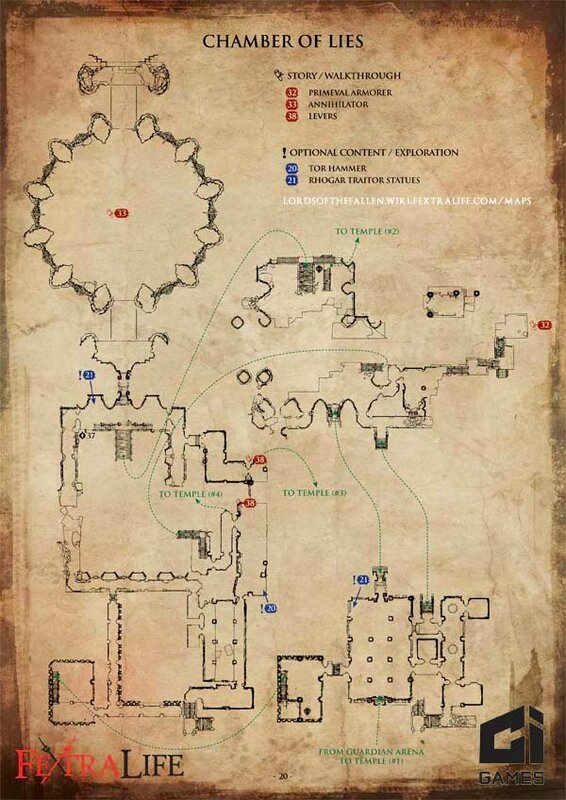 You will have to explore both parts of the Chamber to pull two levers 38 that will pave way to the Primeval Armorer 32 , but the order is up to you. Once you reach the Primeval, Yetka’s quest will reach its conclusion and you will be allowed to proceed to the last Boss - Annihilator 33 . When you defeat The Annihilator, you will now be able to face Adyr - the god. After your encounter, Kaslo will appear and explain that something’s happening in Keystone. You will be sent inside the Citadel. Inside this area there will be a checkpoint to your right, 2 claw Rhogar and a Tyrant. It can be very difficult as there are worse enemies up the stairs. Loot the urn, pick up the Tyrant Heart and kill the enemies. Pick up the Void Shield from a loot shard and hit he lever to the right (looking out over the void). This will open a gate on the other side (note Annihilator's Portal here). Head up the stairs and head left. Open the door and kill the Wizard. Loot the chest and acquire Reminder and Fallen Wrist. Head back through the door and kill the Large enemy and loot the lore, God's Plan. Shoot the barrier and kill the Ghost. There is a chest at the end of the corridor. It contains Glow and Fallen Head and Legs. Head back and to the right, there is a doorway here. There is a Blacksmith Station on your left and enemy on your right. If you break the pot in the corner you will loot a Small Sealed Rune. Head forward and pull the lever. It will lower the platform to Annihilator by a little bit. Shoot the barrier immediately to your left and go through the door. This will take you to the Sacred Hallways. Head to The Portal, which is straight and down the stairs. Kill the 2 Tyrants and loot the 2 urns containing their Tyrant Hearts. One will drop the Polesword Jaw. Head back to the Sacred Hallways, and return to the entrance from the Abandoned Range. Kill the Rhogar and loot the chest next to the Blacksmith location and pressure plate at the end of the hall to reveal Velocity and Fire Resistance Shard. Backtrack down the hallway and head out the door to your left into the Abandoned Range. Head straight, then do a 180, kill the Large Tree monster and head up the path to The Last Traitor Statue. Head left and then go right down the ramp into Eternal Flame. There will be 2 large monsters here, so be careful. Kill them and then shoot the seal with your Gauntlet and loot the chest on the left. It contains Faith Chest and Head. Head through the door at the end of the hallway to the Chamber Entrance. Inside the Chamber, there is a chest to your right and Yetka to your left. The chest contains Last Willand Fiery Witholder. If you speak with Yetka she will give you the lore, God's Wrath, Fire in the Sky, Prayers, Ultimate Sin and the Stone of Divine Understanding. You can use this stone to decipher the runes on walls which contain more lore. If you use the runes next to you, you will acquire the lore, The Triumph. The urn containing the Tyrant Heart is through the first door on the left (up the short stairs and immediately to the right). There is a First Warden here and a checkpoint. Up the stairs are two more enemies and a chest containing Eternal Legend Head. Head back out and to the main chamber and kill the wizard (if you haven't already) and the Tyrant. Head left and kill the two claw enemies. and grab the lore Their Image, to the left. Head through the now open door next to it, jump across and collect the Staff's Head from the chest (you will need this later). Head back and go right (the passageway to the right of the barrier, but not to the Chamber Entrance). Kill the Wizard here and head up the stairs. Carefully shoot the two large spiders from the ceiling with your gauntlet in this next room and be careful not to fall in the holes here. There are some little spiders to kill as well. There is a locked door to the left of where you come in that requires the Right Wing Key. A door all the way to the right (past the holes and spiders) and a door to the right of this door that is sealed by runes. Inside is a chest containing Weapon Hilt and Spine Slasher. Past it is a shortcut door. Open it and head back and go to the right and kill the spiders. There is a Blacksmith Station here. Head up the stairs and get the lore item You Are Safe. It's on the right here and can be hard to see as it is mostly under the floor. Kill the wizard and kill the two archers in the next room. One of the them drops the Right Wing Key, which opens the door that was locked in the room with spiders above. Equip the Staff's Head and stand in front of the odd gated door to open it and gain the Unity staff. Carefully drop down to the room below that had the spiders and open the locked door. Again watch out for the holes. In this room is Crusher and Eternal Legend Chest. Head back up to where the archers were (where you just were) and go straight (don't jump across). In the next room is Tor on the ground to the right. You will use this to destroy statues and gain the Last Traitor Armor Set. Kill the Wizard and Tyrant (whose Heart jar is located to the left of the lever) and throw the lever behind them. Use your gauntlet on the shortcut and then head left and open the door. There is a Wizard here. Kill him and grab the Empty Bottle on a ledge above the stairs that you must jump to. Be careful not to over jump and fall to your death. Now head back the room with the archers. One there jump across and open the door on the right and kill the Tyrant. Go left down the hallway. Be careful not to get ambushed by the large Rhogar in the hallway on the left. Kill both Rhogar and open the shortcut door on your right then head down the hallway that was on your left (now right). Kill the ghost and the Wizard at the end of the hallway and head left to the chest that contains Fallen Chest Armor. Open the sealed rune door opposite the chest and head down to the checkpoint. Head back to the main room (to your right) and head left down the stairs, and shoot the portal on the right. Head through it to the Cave of Lies. Once inside kill the enemy to your right and then make your way down to the large demon. There is an exploding elemental and a Ghost on the way down, so be careful not to fall off. Once down, hit the lever on the right to trigger a dialogue with Yetka. If you let her leave with the demon you will get the trophy She Was The Last Woman Here. Having pulled all three levers, you are now ready to face Annihilator. Go back up the steps and back the way you came and towards the checkpoint. 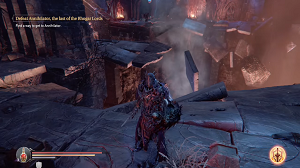 Smash the statue just before it with the Tor hammer to receive a piece of the Last Traitor Armor Set. Head through the portal and go up into Eternal Flame. Head right up the ramp and break the statue to the left (again with Tor) to receive another piece of the Last Traitor Armor Set. Head down the path to the right of the statue and go straight, then right (like you were heading to Infiltrator. Once in The Portal (the area where you fight him), head into the Altar Ruins. Head up to the second floor checkpoint and destroy the 3rd statue. Drop down and head through the big door where there was a gate and portal. Kill the two small claw guys and head up the stairs. On the left-hand side is the 4th and final statue that contains the last piece of the Last Traitor Armor Set. Head up the stairs to the right of the statue and across the now lowered bridge and fight Annihilator. Be sure to pick up the lore Lost Memories on the bridge. You will receive Lightning for defeating him. Head through the portal behind him and you will receive another armor set by attacking the phantoms here.